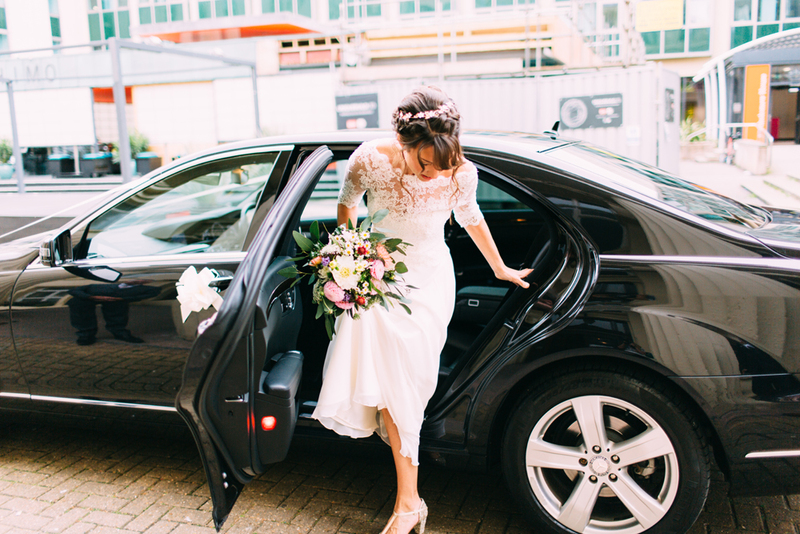 Laura and Jez were married in the historic Chamber Room at Brighton Town Hall, followed by The Coach House Brighton Wedding reception. 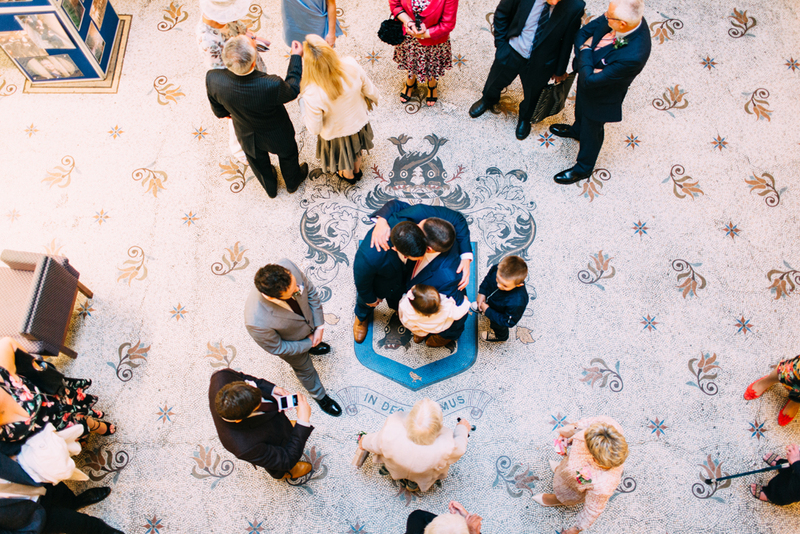 I’ve photographed Brighton Town Hall weddings many times before, but this was the first time I’d worked in the top floor Chamber Room, the biggest and grandest of all the rooms available to hire. If you hire the Chamber Room you also get the opportunity to use the stunning top floor for photographs afterwards, which as you can see is reason alone to hire that room. 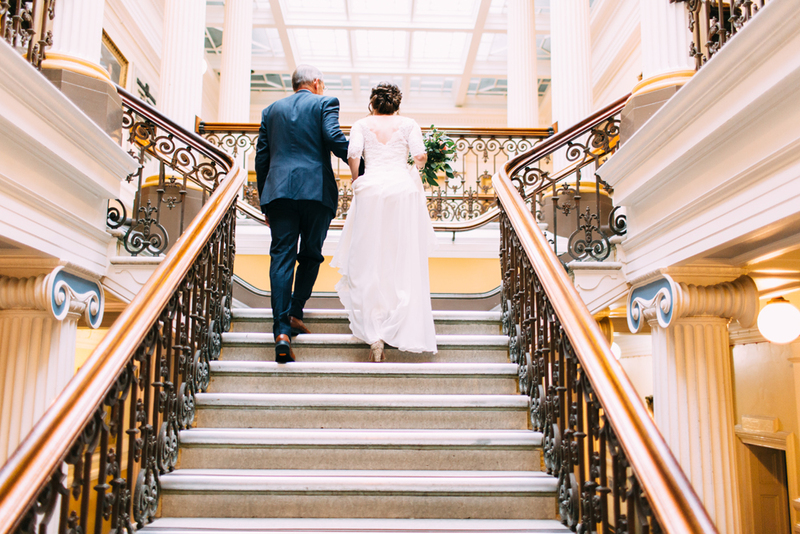 The Town Hall is quite a dark building, but light was just stunning up there which created some beautiful portraits, of course helped by how gorgeous Laura and Jez looked. On leaving the Town Hall they were showered with confetti and cheers, which was then topped off by CONFETTI CANNONS for the group photo!!! I love confetti, and wish that every wedding featured confetti cannons (hint hint to future couples!). Everyone then walked from the Town Hall to The Coach House for the reception, weaving between historic pubs and buildings down narrow alleyways where they were greeted with cocktails and canapés. The Coach House is a great venue in central Brighton, and offered them the perfect informal party. Their family and friends were such good fun, and the speeches were absolutely hilarious and full of love. Their friends had also created betting slips (and very detailed ones at that!) about the length and content of the speeches, which is a great idea and added to the jeers and whoops when certain words were said. Another great idea for future couples! Laura and Jez ticked every box of what makes a wedding great- it was relaxed and was all about just having fun. It’s the biggest and best party you will ever throw, with all of your loved ones in the same room, so forget about whats traditional and expected at a wedding, and just create a fun atmosphere and have the time of your life. Tick and tick Laura and Jez! If you want to see more of Laura’s wonderful ear-to-ear smile then click on the link to view their Brighton Engagement Photo Shoot.